This publication is base on research work done at NID. 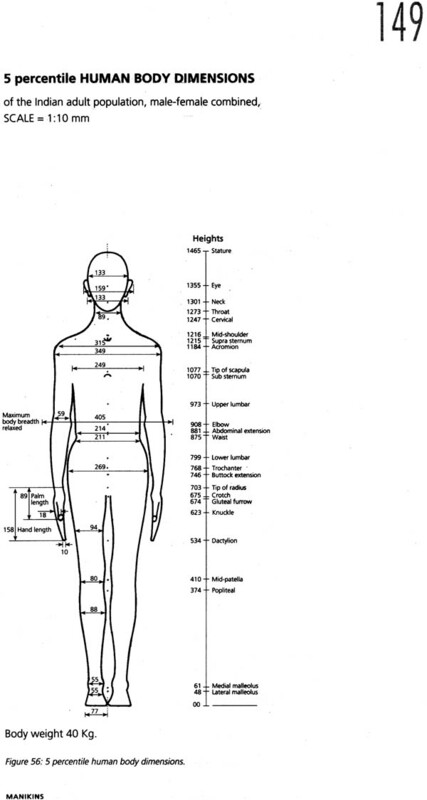 This will serve as a source of reference date for students and practising designers, architects, interior designers, engineers, ergonomists, and others, who require Indian human body dimensions covering the adult population. The data can be applied to multipurpose design uses. This book also includes guidelines for design applications of the data provided. The National Institute of Design (NID) was established in 1961 as an autonomous national institution for design education, training, service and research. NID's core activity is its Professional Education Programmes; its design service keeps NID in close contact with marketplace realities and needs, and its research activities concentrate on emerging sectors of design application. In this context NID commenced its activities in Ergonomic studies in 1984 with the establishment of its Ergonomics Laboratory. Since then, ergonomics has been an integral part of design education, research and client service at the Institute. The Laboratory has- made significant contributions to ensure that human compatibility factors in the Indian context, features in the design of products and systems developed at NID. As part of its research activity, the Ergonomics Laboratory undertook an ambitious project on developing a data kit on Indian anthropometric dimensions for ergonomic design practice. Six years of intensive field work by a group of ergonomic experts headed by NID's Dr. Debkumar Chakrabarti, has resulted in satisfying this long felt need. This data- pack would, for the first time in India, provide basic Indian anthropometric data as ready reference for multipurpose design use fundamental to Indian industry. In keeping with NID's commitment towards design resource dissemination to a wider readership, it is with justifiable pride and hope that I dedicate this volume to all the practising designers in India, NID's alumni as well as other professionals. The world, comprising both the natural and man-made environment, is said to function because of man's versatile and adaptive nature. This adaptability of man in every sphere of life seems to have worked quite well in this fast changing world. No limits were specified and recently, unlike in the past, materialistic and industry-based technological advances have led us to appreciate the importance and need for the optimum use of human resources. Unfortunately, this has not been given due emphasis in industry by the management, planning and design departments, which adapt the man-made environment for man's use. 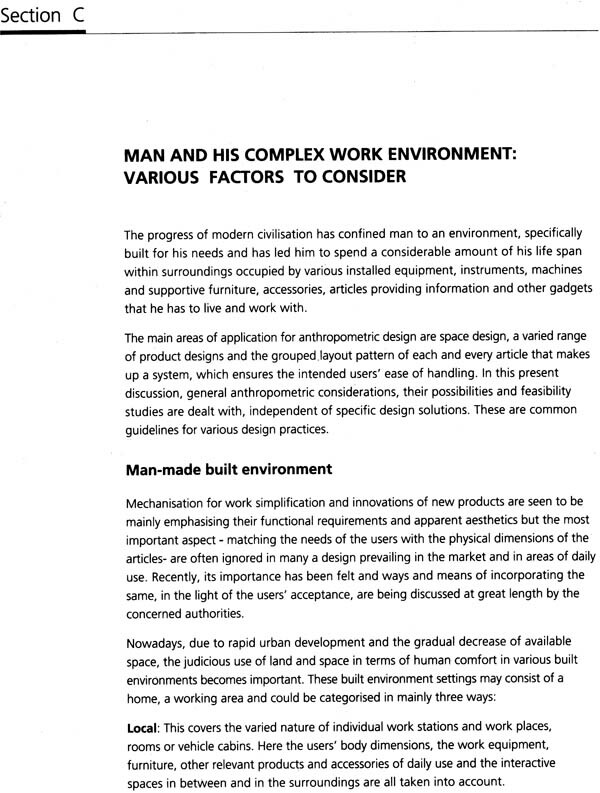 It has been noticed, that the lack of adequate knowledge and account of human facilities and other limitations and the cost effectiveness of the utility of human resources, have led man -made designs of daily usable commodities and work space, unsuitable for the users. This dearth has greatly decreased human efficiency, performance, operational smoothness, etc., causing dissatisfaction, and thereby adversely affecting the acceptance of the designs by the common users. 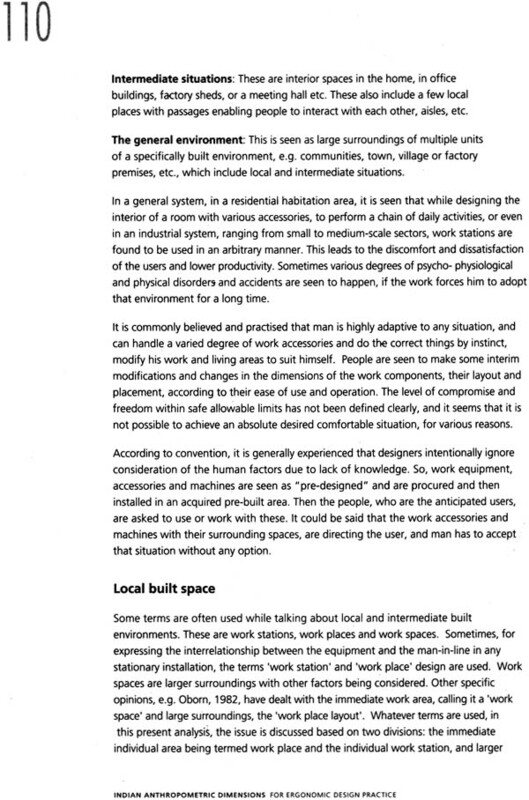 Man with his structural, physiological and behavioural limitations should be considered when designing. Starting from the late 1930s after World Wars I & II, a discipline called Human Factors grew in the USA. It was known as Ergonomics in the rest of the world. Its international affiliate is named International Ergonomics Association. The term Ergonomics was chosen for the same discipline in India, and the Indian Society of Ergonomics (ISE) started functioning from 1987 in its registered office at Calcutta. But the actual practice of this discipline in India started long back as evidenced by the publication of the first Indian book of its kind by Pannathur & Goshal in 1966, and by the Calcutta University, Department of Physiology, in 1971. At present, practice and research in this field have spread to a fair number of institutions in India. The philosophy of ergonomics operates on the premise "Better design for people". Whatever we design should cater to the needs of the common man. Furniture is designed for man to use, not as an amateur art piece. Even fancy designs, apart from their aesthetic value, should satisfy the needs of man. If the user is not comfortable with the design of an article - the individual product or a combination of relevant products of a system - or the layout patterns of these within a legitimate space obtained through various innovations, then these can never be considered as good designs, however perfect they may be, because they will have lost their acceptance value to the user. Irrespective of the investment capacity of manufacturers, user friendly design is a must. To provide this is not only the task of the large industrial sector, but also of the very small sectors and ergonomics is in fact applicable to every sphere of life. Appropriate technology must be developed for common use through awareness and practice of the science of ergonomics. Relatively small investment (the financial outlay should be affordable by most enterprises). Easily available material and labour, wherever possible within the enterprise itself. Nominal training to use them. The ability to cater to local needs through low-cost improvements or appropriate technology. Other considerations are health hazards, occupational safety, methodology and organisation of work, design activities, user motivation. These requirements may vary according to the local context and the enterprise concerned, because in certain contexts even minor expenditure may be beyond one's financial capacity. Whatever the conditions, design dimensions and other features should be compatible with human features as much as possible. To find ways and means of achieving the required dimensions, Ergonomic principles can play an effective role. Ergonomics, through its continuous development as a discipline, could be defined as the appropriate application of available scientific information about human beings to design, thereby enriching the same by establishing an optimum interaction between man and the usable things developed by him. It requires a multidisciplinary, scientific approach towards studying the work method and accessories in the context of physical, physiological and psycho-sociological capabilities of people. It also means evaluating the facilities, environment, jobs, training methods and equipment to match with the capabilities of the users, and thereby reduces the potential for fatigue, errors, discomfort and unsafe acts. There are various approaches to reaching an ergonomic design solution. One of the most important factors in ergonomics is to provide a well-designed article or a system with proper safety, comfort and the confidence for free use. It is said that human bodies are designed for the past. But with innovations in life-style, he/she still has to use the same body and hence, several anthropometric techniques have to be applied. 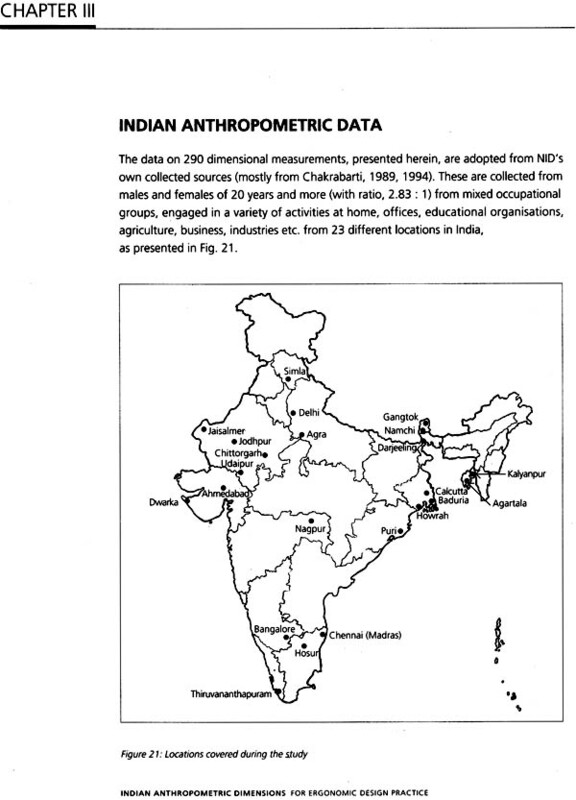 From time to time, anthropometric data are generated covering various population groups in different countries and available references on these are mostly based on non- Indian sources, of both military personnel and civilians. At present, these are being used by Indian designers and thus design solutions do not match. Accidents or some other serious mistakes may occur if design dimensions do not exactly match the specific body dimensions of the user groups. It is advocated by experts that anthropometric data to be used for a specific user group, should be based on the same population. Designs with anthropometric data obtained from a specific group may differ from those elsewhere. Such anthropometric data on the Indian population for the direct use of the Indian designer are very limited, even though some scattered studies have been done. After continuous dialogue with designers and architects, the National Institute of Design, over the years, felt a need to undertake applied research in ergonomics, with the intention of improving the quality of general design activities in the Indian context. The recommendations of the National Co-ordination Workshop on Ergonomics at NID in 1985, the annual meetings of Indian Society of Ergonomics and various panel meetings of the Bureau of Indian Standards have emphasised the need for the generation and standardisation of Indian anthropometric data. Many industries, organisations, academic institutions and practising designers have requested NID to provide relevant data of Indian human body dimensions for a variety of requirements, since they are not readily available at present in any compact form for easy reference, in a publication. The National Institute of Design, through its ergonomics laboratory, has started work towards generation of basic Indian anthropometric data for multipurpose designs since 1986, (rather than using Zoological and Sociological evolution-based anthropological measurements, Gupta and Dutta, 1966) and has developed various data sets including Indian Anthropometric Data for Designers' use in 1989 and A Study on Indian Body Dimensions for Home Interiors and for Furniture Design in 1994. Data generated from these two are used here as the main data sources. In this present book, the anthropometric data requirements in various design contexts in general are being dealt with, with the support of NID generated data, so that architects, engineers, interior designers, industrial designers and other concerned people can use it for reference, to make compatible products to suit the body dimensions of intended users. To develop an awareness of the importance of incorporating anthropometric considerations in the field of design. 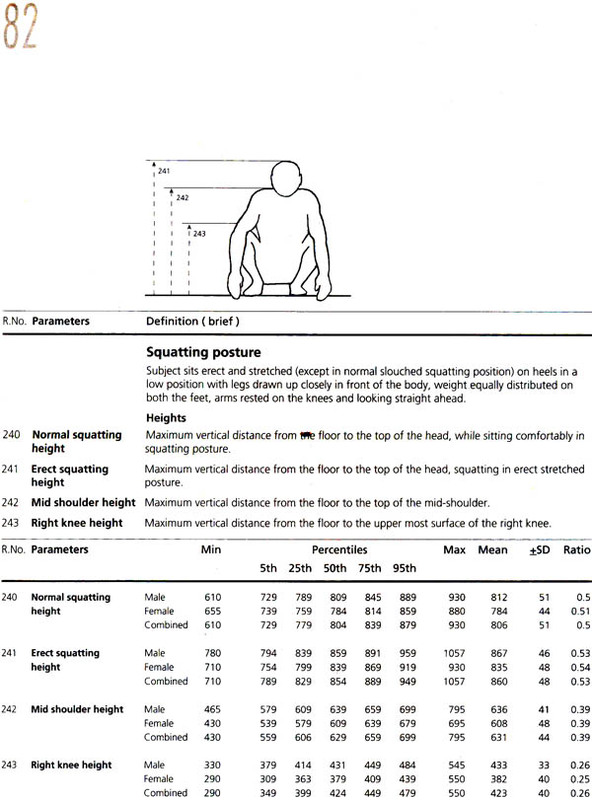 To provide an Indian anthropometric data reference pack. 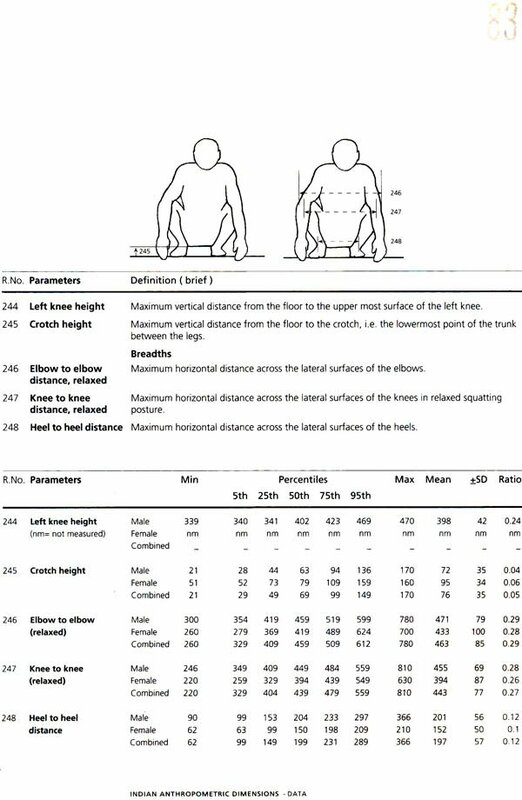 To provide guidance based on these data, illustrated with a few design applications, and discuss areas where professionals most frequently require anthropometric references. This book is divided into two parts. Part I presents an overview of anthropometry, with the intention of familiarising the designers as well as the layman and students. Part II deals with the Indian anthropometric data pack and its relevant applications in the field of design. It is expected to serve as a data source on Indian anthropometrics and give guidelines for general use of the same in the field of design. It does not contain any specific design solutions for ready reference.